A super cute YA series! Susannah (Suzy) is a mediator who can communicate with ghosts. She is 16 and moves from NYC to California when her mother relocates to be with her husband (Suzy's step dad)Little does Suzy know that her mediating powers will be required at the new school she joins.Add to this , a bunch of motley step brothers,couple of "nerd" friends ,a cantankerous vile ghost and a friendly "hottie" ghost , and you have the perfect recipe for a fun-filled book. I enjoyed reading the book immensely- it was definitely a breath of fresh air after a few boring books I've been reading lately. Suzy makes for an adorable heroine..Meg's writing is fun and spunky.Oh, and there is a bit of humor in the book too.. What more could a girl ask for? Overall , a really sweet breezy book ! Smita.. my first Meg Cabot book and I loved it ! So true, so YA lit is just total fun! 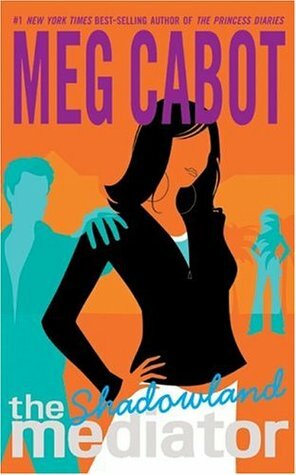 Haven't read a Meg Cabot book since a long time. Should get back to her Princess books and may be try the new Vampire series she has written recently. Some of my blogger friends love her Mediator series but I haven't tried it. May be I will. Veens.. :-) Sure is ! Bhargavi - a question - do you have a different range for rating each genre? Would you give a five only for books considered as literary or for any other genre also (for example YA / children's lit.) ? Just asking to know if reviewers have their own prejudice. TV.. not really.If I really liked it , I would give it a 5 irrespective of the genre. I remember giving Bridget Jones a 5 once upon time , but really don't know if I will do that now. Couple of Calvin and Hobbes comics got a 5. And some Shakespeare plays got a 2 ..I guess you got the point .If it rocks my world I'll rate it high.